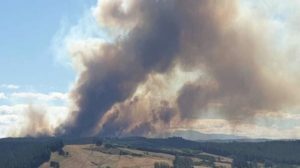 Animal Evac New Zealand is on the ground and working to rescue animals from the Nelson Fire. From door-to-door knocking to ensure residents about to be evacuated have sufficient resources to evacuate their animals, through to going into cordoned areas to rescue stock, and providing our D4H incident management system to register fire displaced animals, we work to support the Ministry for Primary Industries who lead animal welfare emergency management. We urgently need donations. We are a grassroots charity, and literally our bank account is zero. We have thrown all we have to make sure the animals are not only rescued, but someone gives them a voice during response to ensure their needs are advocated for. Can you help? Donations can be made via Give-a-Little or directly at BNZ bank account 02-0506-0139835-002 or 02-0506-0139835-000. We appreciate the amazing generosity of the community. Please follow our facebook for regular update on our fire response.